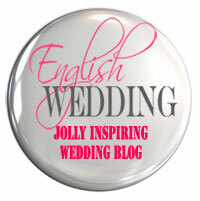 As a bride who tried and failed, I must tell you that you can’t plan for every eventuality. Sometimes things happen which even the most thorough risk assessment could never have anticipated. Like having to call the emergency services on your wedding day because your mother-in-law has collapsed. I should know because it happened to me. If only we’d invited my GP to the wedding reception and not just to the church service. Hindsight is indeed a wonderful thing. Notwithstanding, when you are planning a wedding there are a few things worth knowing which might help you to avoid some of the potholes along the way so that your Big Day proceeds without incident. You’ll find lots of articles in wedding magazines advising you to set a realistic budget but few seem to caution you about ensuring that you have sufficient time to organise a wedding and yet, if you are to maintain your sanity, you do need to take this into account. Organising A Warwickshire Wedding was an immensely time-consuming under-taking because of what is perhaps best described as being multiple layers of self-imposed complexity. Had I been in full-time employment, I would never have been able to co-ordinate the 30 plus suppliers with whom I worked. So my advice to any B2B with a demanding career and busy social life, or indeed any B2B who doesn’t relish the idea of devoting every evening and weekend to wedding planning, is to keep it as simple as possible. Stick to tried and tested ways and don’t try to over-customise. Use suppliers recommended by your venue and if you don’t have any religious convictions, keep everything under one roof. 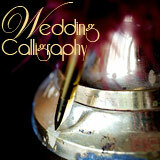 Alternatively, if you’ve got more money than time, seriously consider employing a wedding co-ordinator. More about that below. When asking for a quote from a supplier always check whether VAT is included and if you want anything that is above and beyond the basic package, make sure you ask whether it is included in the price. We got caught out on this one when we viewed our venue, a public art gallery, for the first time and were told that we could have full access to all the collections after hours and that guided tours could be arranged for our guests. Fig.1. 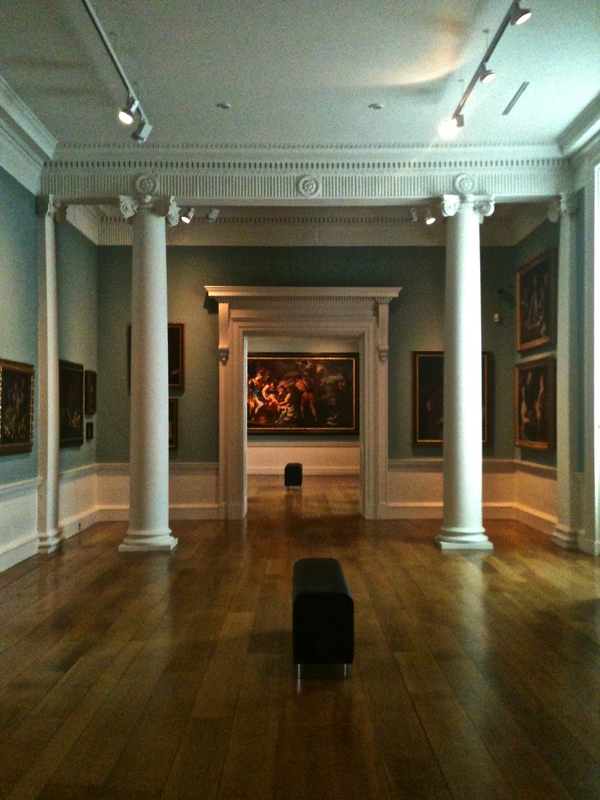 Gallery at Compton Verney. As art lovers, this was a real USP and, heady with excitement, we completely failed to ask whether any additional costs would be incurred. It was only many months later that we discovered we would need to pay for extra security guards to be present in the galleries, as well as tour guides, neither of which we could afford. Not a major blow, of course, but a bit disappointing never-the-less. When it comes to working with suppliers, make sure that everyone is singing, so to speak, from the same hymn sheet so as to avoid any misunderstandings occurring. 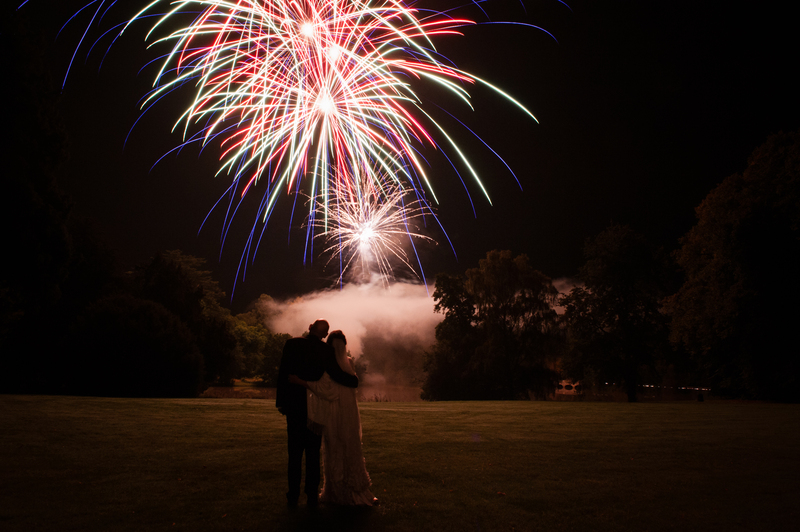 We ‘came a cropper’ when, a couple of weeks before our wedding day, we discovered that the firework company listed as being ‘recommended’ on our venue’s website was, in fact, the only supplier they would accept on-site. This created a minor panic because we’d already paid a deposit of several hundred pounds to another firework company. After many phone calls and a whole lot of angst, we did manage to resolve it all to everyone’s satisfaction but we could really have done without having had this last-minute hassle. Fig.2. Firework Finale over the lake at Compton Verny. The right sort of lighting is key to creating ambiance and is one aspect of our wedding planning for which we scored ‘nul points’. Neither of us even considered asking our reception venue about lighting for the evening party and we only discovered that the lights were limited to an on/off switch the day before when we were setting up the tables. Had we known further in advance we’d have sourced a professional lighting engineer but with less than 24 hours to go, we were stymied. So if you want the right sort of party atmosphere do remember to check that your venue does, at the very least, have some sort of dimmer facility. It’s a little thing but it does make a real difference. The last thing you want on your wedding day is to feel constrained by a rigid timetable but, that said, it is important to keep roughly on track because significant slippage can result in practical and even financial implications. It may be the most magical day of your entire life, but to your suppliers it’s just another working day and you can’t expect them to stay for longer than agreed without wanting to be paid for their time. We learned that lesson the hard way. Fig.3. Time flies when you are having fun. How to avoid that situation is far harder than you might think and even though I painstakingly tried to work out how long everything would take, it still went awry. I can only advise that you draw up what you consider to be a realistic timetable and then inject plenty of ‘time buffers’ in between the different sections of the day. ‘Time flash points’ include group photographs, when a key person can almost be guaranteed to disappear when they are needed, necessitating a search party being sent out to the bar/toilets/smoking area, or when your guests are moving from one location to another. It may only take you and your H2B a mere ten minutes to travel from the church to the reception venue, but it’ll take a whole lot longer when 100 plus people, with varying degrees of mobility, are involved. 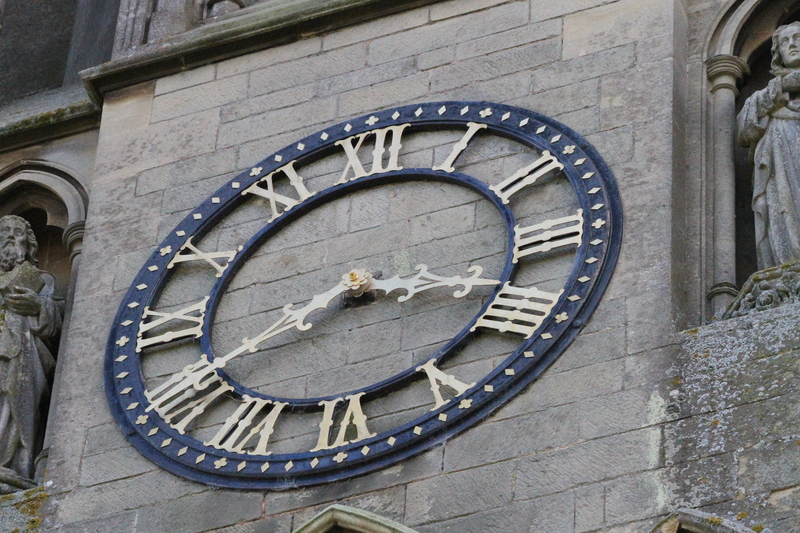 So when it comes to timing, you would be well advised to err on the liberal side of the clock face. A professional pair of hands. For B2B with dreams of a big wedding and plenty of money but no time to organise it, there is a whole industry of professional wedding planners ready and waiting out there, ranging from Niemierko at the luxury end of the market to those who offer support on a rather more modest scale. That said, even if money had been no object, I would never have contemplated hiring a wedding planner prior to the Big Day simply because I was having far too much fun doing it myself to want pay someone else to do it for me. In retrospect, however, I do wish I had looked into having a wedding co-ordinator on the day; someone like Anna at Bride & Glory who could have been tasked to keep the proceedings on track, liaise with the suppliers, respond to the needs of our guests and generally deal with issues as they arose. I suppose that my view is coloured by my mother-in-law being taken ill, which resulted in us needing to reschedule all of the evening entertainment (not as easy as you might think because commercial fireworks can’t be let off after a certain time) and get in touch with the driver of the vintage car which was coming to collect us (again, not as easy as you might think because we hadn’t got his mobile number and had very poor Internet access). But even setting that aside, it would really have helped to have one person dedicated to managing all the disparate elements of the day. MoH and our Best Man did a valiant job, but they were guests and, looking back, it wasn’t really fair to expect them to run around all day. If you do decide to rely on friends and family to help you rather than a professional, make sure you spread tasks evenly and adequately brief everyone concerned about your plans well in advance so that they have all the necessary information at their finger tips should any hiccups occur. If you want to ensure that a sudden downpour has no chance of ruining your Big Day, chose one venue for the whole shebang and make sure you stay there the night before. That way you’ll have nothing to fear from a gloomy forecast and won’t end up checking weather websites every hour the week before your wedding in an obsessive compulsive sort of a way. Alternatively, action can be taken in advance to minimise the disruption caused by poor weather. Invest in one of those lovely bridal brollies on the market that can double up as a parasol and, if your budget will stretch to it, look into hiring golf umbrellas for all your guests. If you have reason to believe that very bad weather is on the way, you might consider taking more extreme measures. 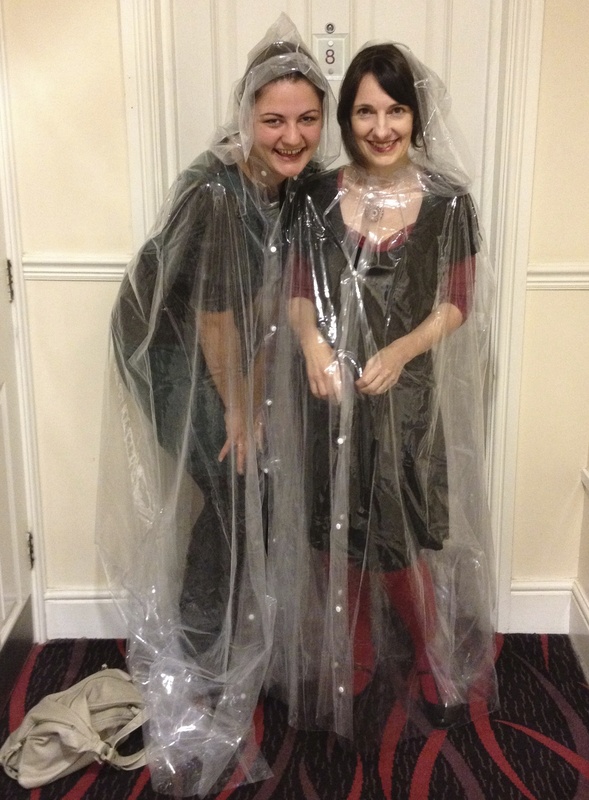 Several days of extremely inclement weather prior to our wedding day convinced me that my wedding umbrella would be wholly inadequate to protect my very delicate dress from complete ruin, so I scoured the Internet and found a bridal mac which we had express-delivered. In the event, it turned out to be a completely unnecessary precaution because 6 October 2012 saw a picture-perfect golden October day dawn, but my mac was one piece of wedding related paraphernalia that I didn’t mind going to waste. This one is a real toughie because feelings tend to run high when it comes to the arguments both for and against inviting children to your wedding. Whilst some couples baulk at the cost involved, others worry about the level of potential disruption. For us, the problem lay in the simple fact that the Adam Hall at Compton Verney could only accommodate an absolute maximum of 100 people, which was completely inadequate given that the 100 adults on our guest list had 25 children between them. We overcame this problem by arranging for professional nannies from Tinies to look after the children in another room during the wedding breakfast which seemed to work well. All of the children were well past babyhood, but if there had been several very young children we would also have considered organising a crèche at the church during the wedding ceremony itself because it would have been disappointing if our wedding vows and the choir had been drowned out by crying. If you do decide to go down this path, however, be aware that it’s not a completely hassle-free option because you’ll need to co-ordinate a whole raft of information about each child. Now that’s one task I’d have gladly have outsourced to a professional wedding planner: there’s not much room for creativity when it comes to listing dietary needs or the name of a child’s GP. When I ordered our lovely wedding post box from Wedding-Postbox, I was probably more interested in it being a decorative element than I was in its functionality. It was only later on when I heard of a couple whose wedding cards, many containing gifts of money and vouchers, had been stolen from a table at their wedding reception that I realised the importance of proving somewhere secure for guests to deposit cards. 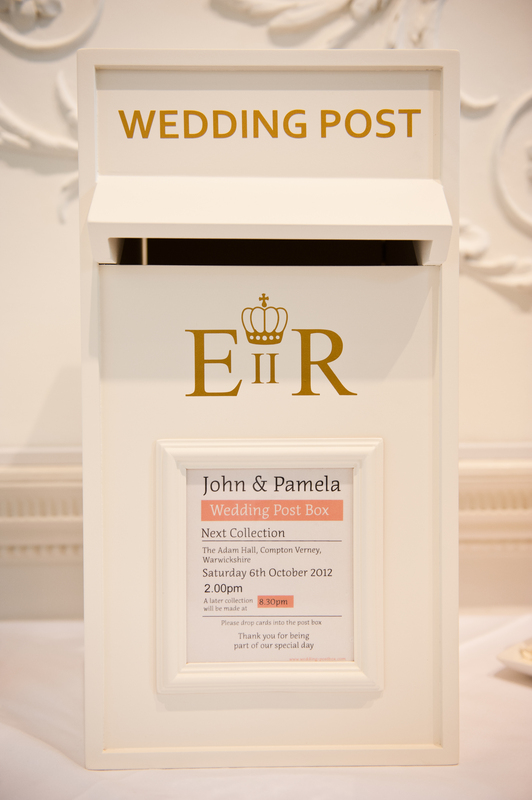 There’s plenty of options on the market but for those blessed with a crafty bias, you could always make one yourself which would have the advantage of enabling you to fully customise it in a sort of ‘pimp your wedding postbox’ kind of a way. Fig.5. Pretty and practical. Available for purchase or hire from Wedding Post-box. Many moons ago, I was emotionally scarred by a bad experience of having had my make-up professionally applied for a special event, only to hate the result so much that I ended up washing it all off before I’d even got dressed to go out. So when it came to the wedding, my initial instinct was to find a make-up artist who would give me a lesson and then apply it myself on the wedding day. After all, if self-application was good enough for the former Miss Middleton, it was certainly good enough for the then Miss Davis. I changed my mind, however, when I discovered Makeup by Charlotte. Charlotte, who having trained at Greasepaint followed by eight years working at the BBC, specialises in bridal, wedding and special occasion make-up, as well as providing make-up tuition. I was immediately attracted to the photographs in the portfolio section of her elegant website and after one telephone conversation I did a complete volte-face and booked her to do my make-up on The Day. Even so, I did arrange for my pre-wedding trial well in advance of October just in case my instincts were wrong and I strongly advise all B2B’s to do likewise because leaving it until the week before could lead to a last-minute panic. In the event, I need not have worried because the way Charlotte applied my make-up and lashes was spot on. Short of plastic surgery, I really couldn’t have looked better. Fig.6. 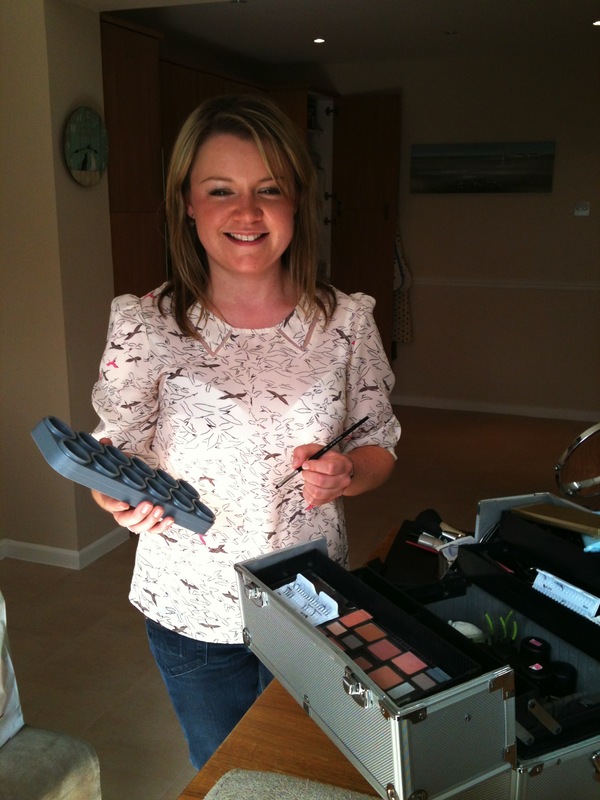 Charlotte of Makeup by Charlotte with her industrial sized box of cosmetic tricks. Setting aside all the specific suggestions I have outlined above, perhaps the best piece of advice I can offer to any B2B is to avoid being too much of a perfectionist and to accept that it’s impossible to control every aspect of the day. All you can ever hope to control is your own reaction. So try to go with the flow and cultivate that frame of mind which regards any hiccups as being mere quirks that make for good post-wedding tales and add colour to the day. And if you do, perhaps you’d drop me a line to let me know how you managed it because this is one piece of information which Mrs Moore is far better at dispensing than she is at receiving.